Time for a Sports Birthday! This Awesome Sports birthday party package gives you everything you need to throw an awesome birthday party for a special boy or girl. 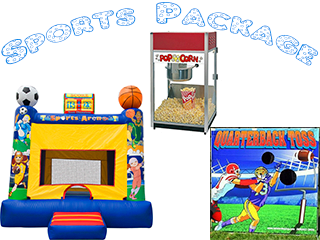 You'll get the amazing Sports Arena Bounce House that is greeting your guests at the entrance, a POPCORN MACHINE, and OUR FOOT BALL TOSS.